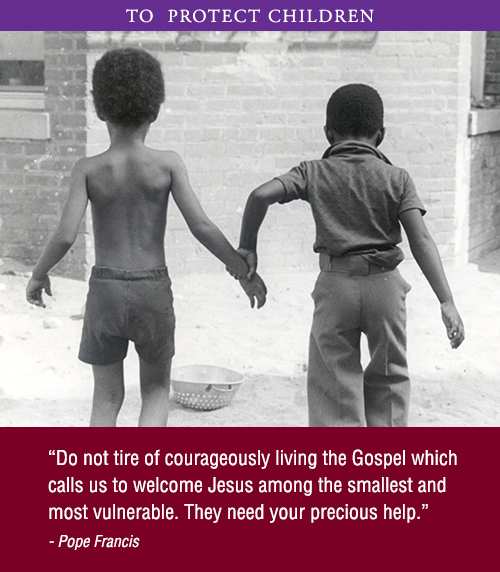 In this Season of Lent we wish to go deeper with an issue that calls for a personal and communal response. 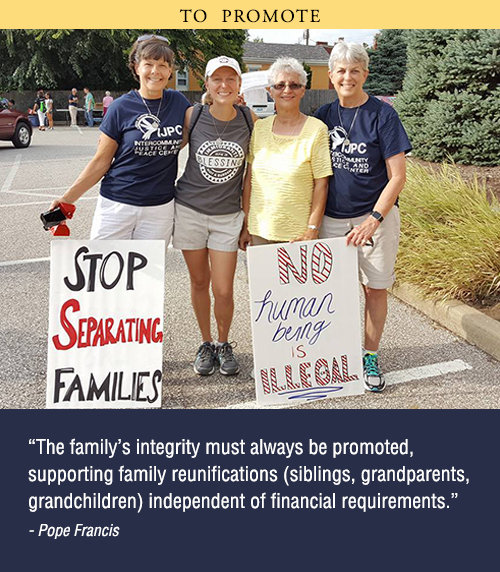 We encourage you to join us in reflecting on recent words of Pope Francis related to the challenges of contemporary immigration. From A Stranger and You Welcomed Me we will use the themes to welcome, to protect, to promote and to integrate, pondering what Jesus would do. Join us every Monday. To Protect: Protecting can best be understood as a series of steps intended to defend the rights and dignity of migrants and refugees, independent of their legal status. As we learn more about situations on our southern border, are work opportunities being offered as migrants and refugees are assimilated into a community? What about health care? To learn how we can improve our protecting of families contact a city where a recent migrant or refugee family has settled. Have they found meaningful work? Do they have access to health care? 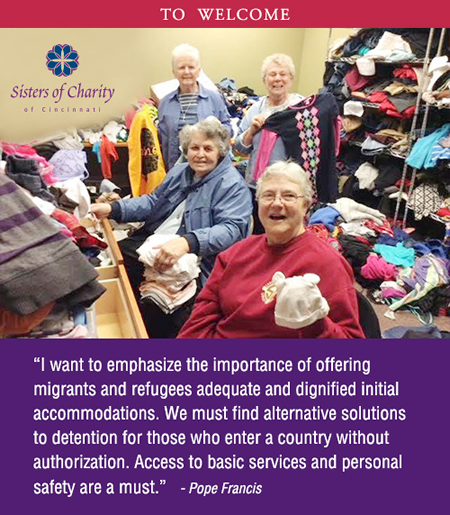 See if you can assist with an immediate need that they have. To Protect Children: Protecting the youngest among us is our call! “Whoever receives one such child in my name receives me; and whoever receives me, receives not me but him who sent me” (Mk 9:37). Children are the most vulnerable among immigrants; as they face the life ahead of them they are invisible and voiceless. Their situation deprives them of documentation, hiding them from the world’s eye. Without adults to accompany them their voices go unheard. How has globalization contributed to this crisis? Choose to learn more about child trafficking. Share what you learn with your family or another person. Can you get involved in your city? 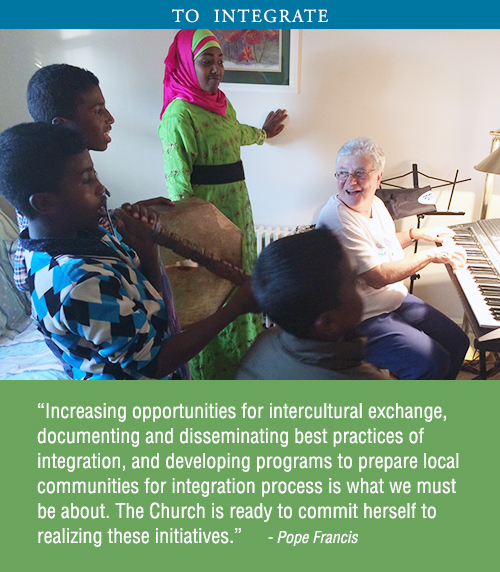 To Promote: Promoting in this context means undertaking a determined effort to ensure that all migrants and refugees are empowered to achieve their potential as human beings, as intended by God. The religious dimension, in communities that welcome them, must ensure that they have the freedom of religious belief and practice. Also guaranteed for all, we should find the possibility of employment, language instruction, active citizenship and important basic information offered in their own language. Is this happening where you live? Inquire as to how recent families in your area are experiencing language classes, work opportunities, etc. What can we do to help? Invite a friend to join you. 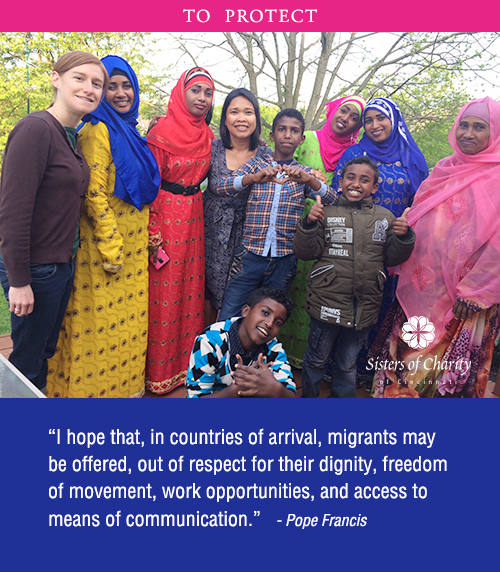 From our Lenten journey we entrust the hopes of all the world’s migrants and refugees, and the aspirations of the communities that welcome them, to God’s Mother Mary. She herself experienced the hardship of exile (Mt. 2:13-15), lovingly accompanied her son’s journey to Calvary, and now shares his glory eternally. 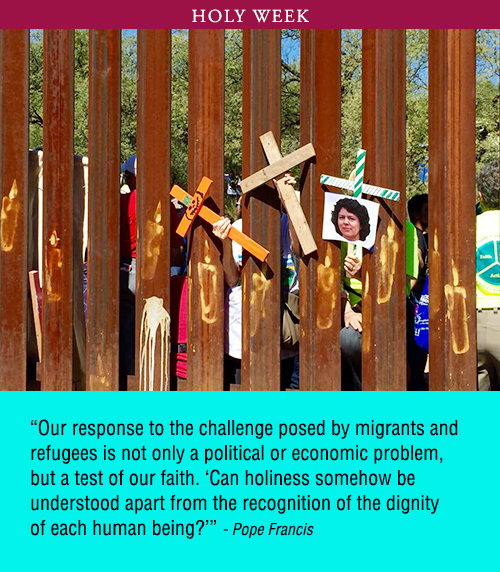 From the graces and wisdom gleaned this Lent, may we all learn to love the other, the stranger, as ourselves. Share a new insight with a friend who appreciates the growth in you. We might ask ourselves: Have I grown in compassion?